Typical cat! But this one is super adorns. Hahaha! Love the expression. Our cat was only affectionate with me when he was younger, and even then only when he felt like it. He's become quite the lap kitty now that he's old. Wonderful crop and stunning on black - FAV. Love those whiskers. I'm not sure this puss is thinking about love at all! Gorgeous shot and like the composition! Beautiful portrait, looks great in B&W! Love your title and your cat! Awesome on black! I think that's such a fab expression, only cats can do that! Fantastic in b&w. Love definition in the eyes. Fav! Fabulous expression. I saw a sign once that said "Dogs have masters, cats have slaves". So true. 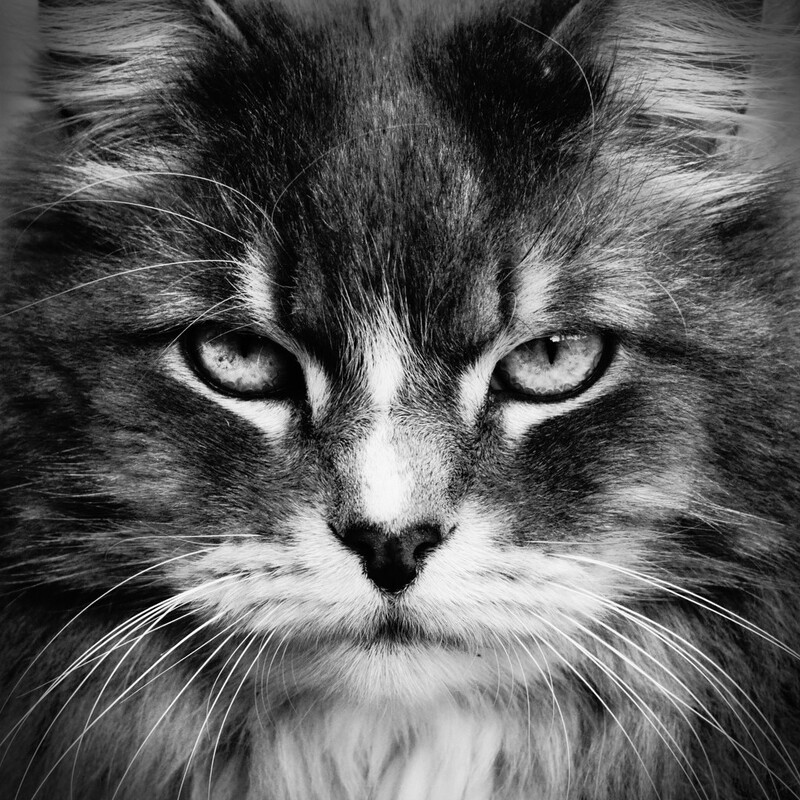 Fabulous cat portrait with attitude! Love it in b&w Vera!! Oh, love the tight crop and 'frontal' portrait! Thank you so much for your comments on our kitty! I am happy you got to enjoy his "looks" without actually facing him in the real life. Not that you could have - he is such a people hater that we have to lock him up every time we have visitors, or "there will be blood...." . @homeschoolmom - We were hoping that he will mellow out when older, but so far, at 14 years old, he is still going strong on not letting any outsiders into our house. @onewing - This is very true!!!!! I don't remember doing your challenge before but I have done so many I can't remember them all. I think this will work for me this week. Open to a lot of ideas. My challenge to you is to click on the flashback button and to take a picture that is opposite of the one you see. The first person I issued this to flashed on a chocolate bunny so she took a picture of a real bunny. Have you done this one before? @joansmor No, I have not done it, it will be fun! Thanks you for the challenge!